I have John Frieda's Frizz Ease line to thank for the amazing hair day I enjoyed the day this photo was taken. Frizz and flyaways have always been my biggest hair concerns, so most days I reconcile myself to looking artfully disheveled at best and like a crazy cat lady at worst. But look! The glossy, touchably soft texture transcends the computer screen, and that lock hanging across my face is practically begging to be touched and twirled around an index finger when bored. Ironic considering I'd never tried the cult-status Frizz Ease line until some of their products landed on my beauty desk recently. 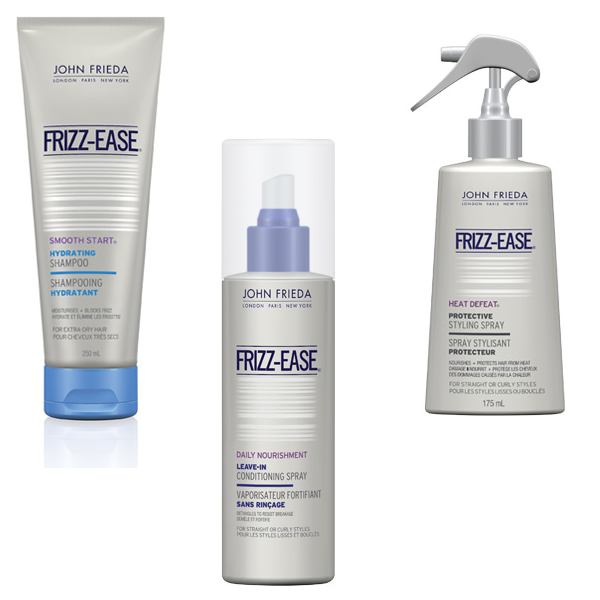 For all its effectiveness, my Frizz Ease routine is surprisingly quick and low-maintenance. I start by lathering up with Smooth Start Hydrating Shampoo in the shower, which moisturizes strands with its frizz-mending complex and natural olive oil. After I get out of the shower, I spritz my hair liberally with Daily Nourishment Leave-in Conditioning Spray, a lightweight but nourishing conditioner infused with vitamins A, E, and C, protein, and moisture. That's followed by generous spritzes of Heat Defect Protective Styling Spray. (The sprays are so light a few measly spritzes don't do much, so I err on the side of excess.) I then blow-dry my bangs and roots and the front pieces of my hair and leave the rest to air-dry. If I'm feeling fancy, I'll put out the straight-iron for a sleeker look. These three products score major points in my books for delivering effective frizz control with very little residue. Another plus: Spraying my conditioner into my locks takes a lot less time than conditioning and rinsing in the shower, which shaves precious minutes off my morning routine. Thanks, John Frieda! Fishtail braids area always popular (tutorial here). Use a thin headband to keep bangs and short layers under control and away from your face. Twist long locks into a low side bun, pony, or braid (side bun and side looped ponytail tutorials here).